I got up early on Monday morning and rushed down to Hains Point to try to re-find a Black Scoter that had been seen floating in the Potomac the evening before. I couldn't find it with my binoculars, but A.P. came with his scope and he found it almost immediately. Once I slapped my eyeballs onto that big yellow honker the Black Scoter passed from the wild realm and into my growing stable of Species Seen in DC, my 200th species, in fact. 200 is a big number in DC. No one on eBird has 300 yet, and according to a very good birder in the city I am the 35th person to hit 200. (eBird only has 20, not sure how he knew of the rest.) I'm in pretty good company with some of the best birders in DC. What's more, I'm now clearly ahead of one DC birder who has a big reputation but whose DC list was, in reality, crap: President Theodore Roosevelt. 26th President? Great. Father of American Conservation? Big whup. All that stuff was just distracting him from chasing rarities in his backyard. Yeah, yeah, you're saying, but eBird didn't even exist for Theodore Roosevelt! Hush, now. We actually have a pretty good idea of which species Roosevelt saw in DC. 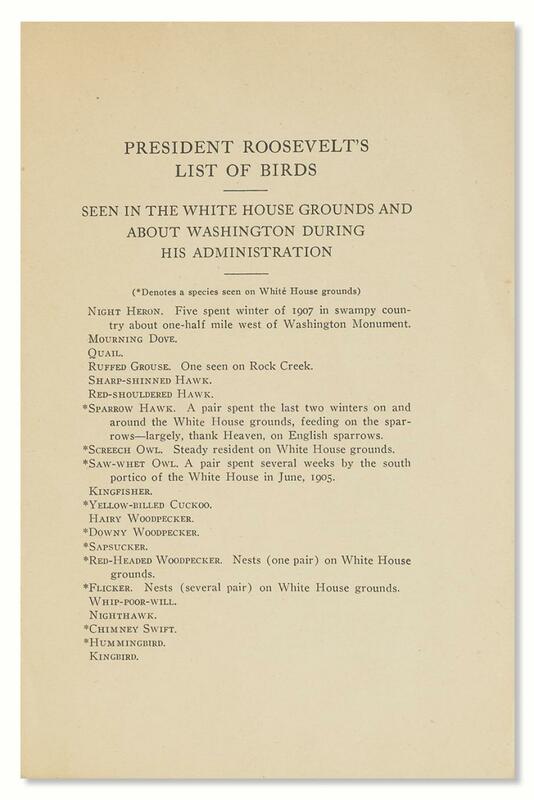 In 1908, Lucy Maynard, working for Bird-Lore Magazine ("The Official Organ of the Audubon Societies"), asked President Roosevelt for a list of all the birds he'd seen in the District. He agreed, because he was an awesome dude, and sent Lucy a hand-written list of all the species he could remember. How many species did Roosevelt see? 93. The Father of American Conservation only managed to see 93 species in DC. Amateur hour. I did a Big Day in the District back in May and broke 100. Click the link above to view the whole list. Look, I'm not going to deny he saw some good birds. Kentucky Warbler? I don't have that. Eastern Screech-Owl? Don't have that either. But are we sure about all these? Did he have anyone reviewing these records? He claims that a pair of Saw-whet Owls "spent several weeks by the south portico of the White House" in 1905. Sure they did, Teddy. There hasn't been a DC record of Saw-whet Owl since 1987 and we're just going to believe you that some hung out in your back yard? Cool. Oh, and no one is allowed to come see them because of "national security" reasons? Yeah, gotcha. COUGH stringer COUGH. So, I just wanted to take a moment to appreciate an important American: me. If I ever hit 300 in the city, I'm carving myself into Mt. Rushmore. Congratulations on your achievement! You're making Maine very proud. From now on I am going to end all of my eBird entries with "Doubtless this list is incomplete; I have seen others that I have forgotten."